The Genesis G4LF series horns and horn strobes produce a low frequency (520 Hz) tone suitable for sleeping areas. The horns have jumper selections for high/low dB output as well as temporal or steady tone (high dB, temporal tone is factory default). A slide switch allows you to select the candela rating of the strobe, ranging from 15 to 110 cd. When connected to compatible control equipment, G4LF Series audible output remains synchronized with all Genesis audible signals on the same Notification Appliance Circuit, including standard 3.2 kHz Genesis audible signals. 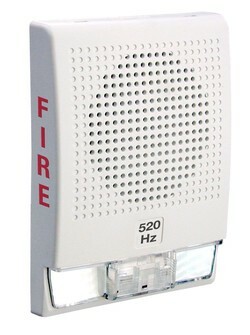 Units are available in red or white, with or without FIRE markings.